Robin Lindley (robinlindley@gmail.com) is a Seattle writer and attorney, and features editor for the History News Network. His interviews with scholars, writers and artists have appeared in HNN, Crosscut, Writer’s Chronicle, Real Change, The Inlander, and other publications. He is a former chair of the World Peace through Law Section of the Washington State Bar Association. Not Alexander, not Hannibal, not even Julius Caesar had fought across such a vast, inhospitable terrain. Charlemagne’s victories would havehad to double to match Bolívar’s. Napoleon, striving to build empire, had covered less ground than Bolívar, struggling to win freedom. Latin Americans admire military and political leader Simon Bolivar as the Great Liberator, a founder and hero akin to George Washington in the United States, the most influential figure in their history. In his campaigns from 1813 to 1825, Bolivar freed six modern countries from the yoke of Spanish imperial rule -- Venezuela, Colombia, Panama, Ecuador, Peru and Bolivia -- an area seven times the size of the original American colonies in harsh terrain from unexplored deserts and dense jungles to rugged, snow-capped mountains. Bolivar was a brilliant military strategist who lacked formal military training and a founder of republics and government institutions but a flawed politician. He was acclaimed as a hero and conqueror at the height of his military career, but died in 1830 in poverty and exile. Despite his important role in modern history, most North Americans -- including me -- know little of Bolivar’s life and legacy. 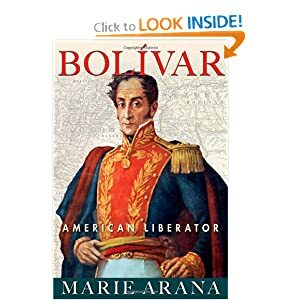 As a corrective, acclaimed author and critic Marie Arana has written a sweeping new biography, Bolivar: American Liberator (Simon & Schuster), with the intention of introducing the Liberator to North Americans. Propelled by the ideals of the American and French Revolutions, the concepts of liberty and justice, Bolivar the general could be merciless and unforgiving in war, and Bolivar the statesman, abolitionist and diplomat could be authoritarian and ineffective in affairs of government. To tell the complex story of Bolivar, Ms. Arana reviewed thousands of primary documents in Spanish as well as in Portuguese, French and English in archives in the United States and Latin America. Then she applied her deft skills as an accomplished storyteller to the fruits of her research to craft a magisterial biography of Bolivar. Marie Arana is a celebrated novelist and journalist. She was born in Lima, Peru, the daughter of a Peruvian father and an American mother, and she has devoted much of her writing career to explaining Latin America to North Americans. Her acclaimed memoir American Chica, an account of her bicultural childhood between North and South America, was a finalist for the National Book Award, the PEN-Memoir Award, and was named best book of the year by several publications. She also is the former book editor for The Washington Post, and her book The Writing Life collects her essays on how writers think and work. Further, her writing includes two critically acclaimed novels set in Peru, Cellophane and Lima Nights, and the script for the recent film Girl Rising. Ms. Arana graciously discussed her biography and the legacy of Bolivar by telephone from her office at the Library of Congress in Washington, D.C.
Robin Lindley: Congratulations on your sweeping new book on Simon Bolivar. You’re an acclaimed journalist and novelist. What prompted your foray into history with this magisterial biography? Did you see a need for a new portrait of Bolivar? Marie Arana: I have been steeped in history for all of my life and for a good bit of my career even though it was a crypto-occupation with history for me. For many years as a books editor at Harcourt Brace Jovanovich and then at Simon & Schuster, I edited history books and biographies. I was very aware of how you build one and make one work. Going on to be books editor at the Washington Post, history was one of my favorite genres and I often reviewed it and paid particular attention to it. I also served on several non-fiction and biography prize juries, and so had considerable exposure to the genre. I was drawn to Bolivar because I was trying to find one person who captured a good sweep of Latin American history in one story, and so would allow me to bring North American readers to Latin American in the most engaging manner. There are so few North Americans out there who truly understand the history or have read much about it. There’s very little awareness of Latin America in the United States. And, as I always say, if you don’t know the history, you don’t know the people. When I sat down and tried to think of the one person whose story most affected the region in terms of its history and personality, the one I kept coming back to was Simon Bolivar. There were many reasons for this. For one thing, he changed the Spanish language. His writing is free of stuffy Spanish locutions, maybe because he was at war, in a hurry, and writing three or four letters at a time. Bolivar’s language is very much alive, fresh and vibrant. It was a different way of communicating; certainly different from anything that was being produced in printed works at the time. He also changed the history of a territory all the way from Panama to Bolivia. He became, for me, the history, the language, the very personality of Latin America. He was this great, valiant, historic personality who also happened to be funny, smart, engaging, who loved to dance, and loved women. He was in many ways the kind of person Latin Americans aspire to be. And you have a personal connection to the history. Could you talk about your family connection and your perception of Bolivar when you were a child in Lima? When I was growing up, I often spent time in my grandparents’ house. And I remember that there were three portraits hanging prominently in the living room of that house. They were stern, brooding images of my ancestors. One turned out to be a Spanish brigadier general who fought in the defining Battle of Ayacucho [in Peru] -- Latin America’s Yorktown or Waterloo -- the determining battle of the wars of independence. He was the first to fall. He had charged before anyone else and was killed before anyone else. Across from him was a wan young woman, staring at him day after day in that living room. She turned out to be the daughter of the Spanish brigadier general. She was born after he was killed, because when he went off to fight that battle, his wife had been expecting her. That wistful young woman ended up marrying the third person on the wall, a young patriot soldier who also had fought at the battle of Ayacucho. Which is to say, he fought against the Spanish general, and married his daughter sixteen years later. So here I am, this child of warring factions. It’s nothing new. It happened in the United States with families that fought the Civil War on both sides. But for me, it was a very visible and present thing. I saw those faces every day and they fascinated me. The battle of Ayacucho became a mythic event for me. And so, Bolivar was very much on my mind as I grew up, as was the Argentine independence leader Jose de San Martin, and the whole business of revolution even into the twentieth century. The revolution was also very much on everybody’s tongue, somehow. Everyone was aware of how Spanish you were or how Peruvian you were. Nobody here talks about how English or American you are. We’re past that, but in Peru that sense of the colonial was very much alive. Some see Bolivar as the George Washington of Latin America. Lafayette called Bolivar the George Washington of Latin America. Lafayette admired Bolivar and they corresponded. Eventually, Lafayette became a conduit between George Washington’s family and Bolivar. George Washington’s family sent Bolivar a medallion that contained a lock of Washington’s hair, and Bolivar treasured it. He loved being called the George Washington of South America. But Bolivar was a polar opposite of George Washington. I never grew up thinking he was anything like Washington. He was as singular a figure as George Washington. And Bolivar was not particularly loved in Peru. In the process of writing this biography, I have come to admire and respect him. But I grew up in a country that resented him because, in the course of liberating Peru, he actually reduced it. Before the revolution, Peru was grand and sprawling. It had been the heart of South America when it was a colony. It was rich and important, the power center of the empire. Bolivar called Peru the land of gold and slaves. But when Bolivar liberated Peru, he shrank it. Peru went from being a great hub to being a republic among many others, and its power was reduced drastically. So Peruvians resented that and couldn’t help but ask, Why do we have these borders that we didn’t have before? Why don’t we have the influence that we had before? Certainly my father was not a fan of Bolivar. Peru ended up glorifying Jose de San Martin, which is ironic, because San Martin couldn’t get the job of independence done. San Martin came from Argentina and he liberated one city, Lima, but he was stalled, and couldn’t liberate the rest of Peru. So he went begging to Bolivar, and Bolivar essentially said that there was not room for both of them in Peru. The Peruvians love San Martin for stepping aside and letting Bolivar finish what he started, and it’s San Martin’s statue that is biggest in the center of Lima, but that’s certainly not the case in Venezuela, Colombia or Ecuador, where Bolivar is the hero. You vividly recount Bolivar’s life of amazing resilience and pronounced contradictions. What are some of the salient things North Americans should know about Bolivar? I’m among the ignorant and learned a great deal from your book. Thank you so much. The one thing to remember is that these two regions sprang from very different histories, very different territories. The revolution fought here over the rolling landscape of New England and the Mid-Atlantic was very different from the revolution fought in South America. First of all, the South American territory was seven times the size, and included jungles, steamy tropical rivers and the Andes with its impossible, snow-capped promontories. So there’s that geographic difference. And then there’s the most important part -- the colonizers they were trying to overthrow. The Spanish colonial system was so much more entrenched than the English colonial system in early America. It had existed much longer with laws that lasted for centuries -- harsh and limiting laws. Race became important and very clearly defined, and the color of one’s skin was registered at birth and monitored. That history created a very different kind of person than the North American. I’m making no judgments. It’s just that if you have lived through a different history, you are bound to have a different character. That is what I want to be understood. The Hispanic personality is defined in a very different way than American history defined early Americans. Race is an important aspect of the story you tell. Bolivar eventually recruited Indians and mixed race people to his ranks and abolished slavery in 1816, almost a half century before abolition in the United States. Race was a huge part of the wars of independence. The wars could not have been fought and won without engaging all of the races. That was not true in North America where it was as if we pushed race aside and carried on the revolution with race outside the picture. By the time the wars of independence began in Latin America, it was a cauldron of 300 years of race mixing even though there had been strict laws to keep the races separate. All you need to do is look at the records of birth in Spanish colonial America, and you’ll see that race was clearly recorded. You were fined if you were darker. You had to pay fines or taxes if you were black or Indian, either by producing gold or currency or by enslaving yourself for a while to pay off the debt. So it was a very harsh system. Bolivar’s revolution was started by the Creoles, the rich whites, who were irked because they didn’t want to pay taxes to a foreign power and because native-born Americans were not in charge of their own destinies, leading the businesses. The rich white Creoles asked, Why aren’t we in power here? We are often more knowledgeable than the Spanish who are sent here to rule us. They were very much like the United States founders in that respect. But they couldn’t get the revolution off the ground. It took Bolivar three times to get it going. The third time, he came back from self-exile in Haiti where President Petión had told him that unless he engaged all the races, he would never get the revolution off the ground. Bolivar understood that so profoundly that, after his exile, he said it was clear that he had to emancipate the slaves and get all the races on his side. As far as he was concerned, the enemy was Spain and every color of man needed to unite against that enemy force. In a methodical fashion, he set out to unite the races, which hadn’t been done before. Spain, in fact, had been trying to get the slaves to oppose the revolution, but Bolivar managed to win many of them to his side. In some respects, South Americans are ignorant of this fact. They don’t realize that the armies that won the revolution against Spain were largely colored, led by Bolivar and his generals. What was the role of the Catholic Church in Bolivar’s campaigns for independence? It was a confusing time for the Church and institutionally they knew they had to stick with Spain. At that time, Spain was the most Catholic nation in the world, and certainly the most successful in spreading the Catholic faith. At the beginning of the revolution, the Church was very close to Spain and any time something happened to crush the revolution they’d say, “Aha. You see God is on Spain’s side.” But as time went on, and throughout the Church history in Latin America, there were divisions. The Jesuits were famously on the side of the indigenous people, although they were also very strict with them. That political involvement was a departure from the Church’s official line, and that’s why the Jesuits were booted out of Latin America in 1767. The moment that the revolution was over, the Church immediately went over and supported independence. And indeed, nobody had been fighting the Church. It would always be on the side of the powerful. After the revolution was won, it supported Bolivar. We don’t know how faithful or religious Bolivar was, but he was very respectful of the Church. When he was in power, he always supported the Church because he knew it was the glue that kept the Latin American nations together. He wanted to unite all the republics of South America and he knew the Church would be useful in this, because it was the one thing (along with language) that united all of the people of South America. Bolivar’s resilience was incredible. It’s almost painful to read of his many military defeats, yet he always came back to emerge victorious in campaign after campaign resulting in the liberation of Venezuela, Colombia, Panama, Ecuador, Peru and Bolivia. It was well known that Bolivar was greatest in defeat. When he suffered a loss, he came back like a raging bull. And it was after a defeat that he’d have his greatest victory. He was brilliant at scaring the Spanish in every which way -- by doing the most difficult thing. By going over the impossible mountain. By surprising a very large garrison with only a few people, but with such force that it terrified the Spanish. The Latin American wars of independence ended up being a terrible struggle with huge losses. So much blood was spent on that revolution. It was so staggering a conflict that whole towns were emptied of population. It’s remarkable that Bolivar opposed and defeated the forces of imperial Spain and yet he was not trained military professional. He was not. He had read a lot and was a glutton for military histories all the way back to the Greeks and Romans. He had a few months of military school that rich boys were put into so they could sit on a horse properly. That was the only exposure he had, and absolutely no soldiering whatsoever. He learned all of it on the fly, which was amazing in itself. Bolivar liberated the colonies but North Americans may be surprised that he favored an authoritarian form of government and he served as a dictator. He didn’t believe that the people were ready for our form of democracy. That’s what he feared. He was devoted to liberation. As he fought, he installed schools and government institutions, but the actual work of governing bored him. He was not a deskman and didn’t like the process, but he realized by the time he got to Ecuador that there was chaos behind him in lands he had liberated and left for others to rule. There was chaos because the Spanish oppression had been so deep that the great masses were not educated. They were unprepared for self-government. Even as Bolivar liberated lands, the revolution didn’t stop. He understood that the populations were not ready for democracy. They weren’t equipped to vote or organize cogent institutions. So he ended up believing that what such a difficult, badly educated society needed was a very strong hand. By the time he got to Bolivia, the constitution he wrote for Bolivia called for a president for life. He took on dictatorial powers in the midst of chaos. In Peru, for example, if he hadn’t taken dictatorial powers, he would not have been able to liberate that republic. He took on dictatorial powers three times in his life, always saying that he hated to do it but had to. He never became a dictator for life. All the same, he recommended a dictator for life in Bolivia. He felt it would be too difficult to control without everyone reporting to one leader. He got a bad reputation for that, and perhaps deserved it in the abstract. He said one person should never assume complete and absolute rule, and then turned around and did exactly that. That didn’t do much for his name. 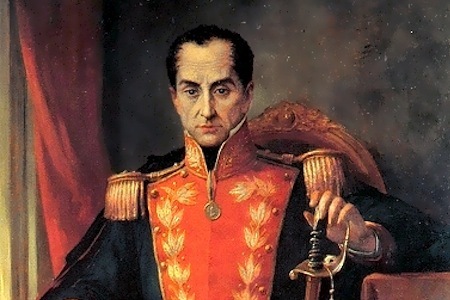 Is authoritarianism part of Bolivar’s legacy for Latin America? My knowledge is limited, but it seems that there’s a history of strong-arm dictators who have governed many Latin American countries until recently. There are Latin American countries that have gone through dozens of rulers in the course of a decade. Military coups and military takeovers are seen as a solution in Latin America. There are dictators who have ruled for thirty years. And the Colombian author Gabriel Garcia Marquez once said that Bolivar was, in a way, the model for it. He may not have meant to be, but he was. Bolivar wouldn’t have planned his career to work out the way it did. It was, to him, a disappointing, heartbreaking career. You can’t say he always had it in mind to be a dictator, but that’s the way it turned out and that’s the reputation he had by the end of his life. It left a legacy of a strong man, a sort of military model, that you find again and again in Latin America. It’s inspiring that today there are more democracies and many democratically-elected leaders. But even with democratically-elected leaders such as Hugo Chavez, they still evince aspects of the caudillo, the strong man. They suspend the constitution so they can run again, and that sort of thing that happens again and again. It’s great to see countries break that trend. In Mexico, a president rules for six years, and then there’s no hope of his coming back. That isn’t true in Venezuela and it’s not true in Peru, where a president can skip a term and then re-seek office. But Mexico is working better than ever before. You see glimmers of progress and sometimes even great strides, but the effects of colonial rule have taken a long time to wear off, and some would say the Latin American revolution is still being fought. Until the last few decades, the whites had been ruling for so long in Latin America. Now, things are changing and you see it. In Peru, for instance, the indigenous and mestizos are as much in power as not. President Alejandro Toledo is 100 percent Indian. But it’s taken a long time for that to happen. Hugo Chavez in Venezuela embraced Bolivar virtually as a saint. Yes, and the formal name of the country is the Bolivarian Republic of Venezuela. It’s become a question of semantics. In some quarters of Latin America, Bolivarian has become a code for permanent revolution. Somehow Bolivar, who was the furthest thing from a socialist, has become a kind of Marxist figure, preaching ongoing revolution. In his lifetime, Marx hated Bolivar. It’s truly ironic that his name is being used as a brand for socialism. People have conflated the notions that Bolivar’s revolution was never finished and that Marx advocated a revolution that would never end. Can you discuss your research process and some of the primary material you uncovered in your research? I was given two great boosts of support. The first was from the Library of Congress, with a resident scholar’s chair at the Kluge Center. I started my work at the library, where there’s a splendid Hispanic collection. And for four or five months, I did research at Brown University, whose John Carter Brown Library has a fabulous collection of Bolivariana. I spent more time at the Library of Congress than anywhere else. I also did research in Latin America but, I found that most of the information was here at the Library of Congress, which was really astonishing. I found marvelous documents on Bolivar’s childhood; and many more primary documents. There are 2,683 works on Bolivar in the Library. It was lucky that I could sit in these marvelous institutions and stare at documents long enough to see clues that I hadn’t read about anywhere else, and then follow those clues to a remarkable past. For example, Bolivar’s father who was a terrible womanizer, a real predator, fell in love with Bolivar’s mother when she was eleven years old and married her when she was fourteen. When I actually looked at the grid of Caracas, I could see that his property was contiguous with the property where this little girl lived. So obviously he’d had his eye on her over the fence. He married her when he was forty-seven or forty-eight and she was a mere teenager. You didn’t start out knowing that they were neighbors, but when you study the maps and documents long enough, it pops up at you. You’re an acclaimed novelist and journalist, and now a historian and biographer. Who are some of your influences as a writer and a historian? I had long conversations about this with a historian I very much admire, Gordon Wood. Gordon said there’s wonderful work being done by historians in this country, but the academy doesn’t encourage them to write in a narrative fashion. They’re almost made to scorn lively writing and so they end up writing in dry, scholarly prose. Fascinating facts are being discovered and discussed in historian circles, but they’re not being made to come alive and engage the very public for which history books are meant. That’s very much how I feel about history and biography. It’s meant for the larger public, it’s the people patrimony, and it should be told in a way that engages and entertains and makes imaginations come alive. I read your novel Cellophane, and I wondered if your writing has been influenced by the vivid magical realism of writers such as Garcia Marquez? I’m a great debunker of magical realism! Reality itself is so staggering in Latin America that it may strike you as almost magical. But what does that say to you? That the reality itself is so terrible and so overwhelming that it seems dreamlike. The Latin American experience has been so vivid and cruel that it becomes like a dream or nightmare at times. If you talk about magical realism in that way, I can understand it. But the term as a literary device is damaging to Latin American literature. It ends up heaping a wide variety of literature into one camp. If you were to say North American literature is dominated by “domestic realism” and it is used again and again in Jane Austen and Edith Wharton and Alice McDermott, you’d be laughed at. Someone needs to break the model and say it’s a silly term. That so-called magical realism, that harsh reality that seems nightmarish, is just part of the Latin American reality. It’s in the literature not because it’s a trick, but because it’s part of who Latin Americans are. Do you have any concluding thoughts on what you’d like readers to take from your biography of Bolivar? I do hope that, even in a small way, this book can engage readers to learn about Latin American history. Someone once said that Americans will do anything for Latin America except read about it. I’m hoping to disprove that. Maybe it’s time for North America to read a few facts about Latin America, about its history and its people. I hope that’s the case.